"This pan-roasted pork loin uses lots of spices and an Asian-inspired marinade for a truly flavorful cut of meat. And it's perfect to use for a Vietnamese bahn mi sandwich!" Place the roast on its side and split in half lengthwise with a sharp knife. Make shallow slashes in a diamond pattern on both sides of each piece. Transfer halves to a flat dish. Heat a heavy cast iron skillet over medium-high heat; add 1 tablespoon vegetable oil. Brown meat on each side, 4 to 5 minutes per side. An instant-read thermometer inserted into the center should read at least 145 degrees F (63 degrees C). Transfer to a plate to rest at least 5 minutes before slicing. 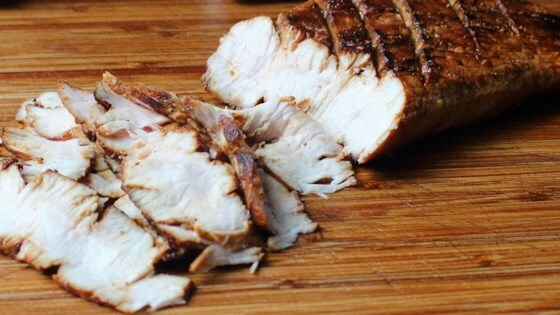 A quick and superbly flavorful Asian-inspired pork loin. You can brush the meat with marinade while it's cooking, but stop basting before the meat has fully cooked. Do not drizzle marinade on finished meat. Leftovers? Try them in this Roasted Pork Banh Mi (Vietnamese Sandwich) recipe. Too salty, drop the sea salt and could use some sweetness, maybe add brown sugar. It was a delight! Just the right amount if spice. I BBQ'd it instead of frying, and I will definitely be preparing it again! Next time it will be for guests. Great flavor. Used exact ingredients, but put it in the crockpot. Amazing and easy. Followed exactly. YUMMY! Great recipe. I will make again. Grand kids and I loved it how ever wife is not a big fan of five spice and thought it was just ok. I did cook this on the grill. I didn't change a thing, it's the bomb! Wonderful flavors together.